It’s been a lil minute since I’ve written here but I’ve been very busy filming, working, auditioning for HUGE casting directors, and recharging my batteries/feeding my soul/going to church. I’ve been thinking about you guys a lot though. I kept thinking back to a year ago when I wrote the article “The Burnout” on here. I’ve gained sooo much insight and clarity lately about that time in my life. I remember exactly how I felt at the time: I was stressed out, tired, unmotivated, and living in a toxic relationship. My… have things changed. I feel like myself again and I live alone now – happily. Everyday I feel recharged and grateful. I live on Hollywood Blvd. in LA, drive my dream car, eat organic and natural foods, have God in my life, audition for big projects every week, film a lot, and my relationship with my mother and father has improved. I’ve healed a lot of deep wounds & issues and I feel thankful everyday that I have overcome such negativity. I realize I am living my dream. Last year, my ex I was living with was stunting my growth (I was in fact outgrowing him and he pointed this out first actually), he was being way too judgmental and critical of me, I was doubting myself, overworking myself to please someone who kept moving the goal posts and laughing at my frustration (narcissists do that), feeling under appreciated, and in a bit of a negative mental place. The enemy was busy and I was exhausted. Of course, I did not see the brunt of all this while I was in the thick of it. I started writing here a lot more because I needed an outlet for how I felt and for my thoughts. 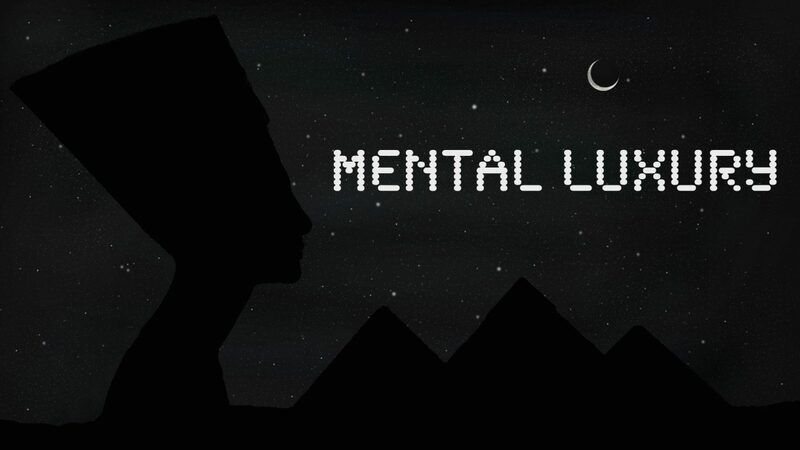 I started Mental Luxury to express myself and share my vision. I’m so happy I did because looking back, I now see what I was truly enduring. And it also gives me a sense of where I’m going. Starting Mental Luxury gave me my confidence back (what I had lost of it at least) and forced me to look at the Big Picture. I saved myself. Mental Luxury saved me. Thank you. I’m so lucky and blessed to be able to wake up everyday in my dream apartment with my dream car, pursuing and making my dreams come true, all while being grateful and appreciative of it all. I hope I can be an inspiration to all of you. Follow your dreams. Make it happen. Keep going. There is light at the end of the tunnel. 2016 was a very emotional year for me. I lost a little, gained a lot, and sacrificed a great deal. It was a year of many lessons, but a good year nonetheless. I lost my long term relationship (which I thought I was going to be in forever). I gained a newfound confidence, an amazing apartment & lifestyle, strength I didn’t know I had, and learned a ton more about myself. I lost fake friends, gained back friends whom really support me, and still struggle to this day with me and my mother’s relationship. There were so many changes, but I have never been afraid of change. I know change is needed in order to grow. I got very busy in my career, worked some good gigs, and became extremely focused on my life goals. 2016 was a year of clarity for me. I prayed to God for clarity after my relationship ended and concluded that I was with an abusive toxic person who didn’t truly love me. How could I have been so blind? I trusted and loved openheartedly and my greatest fear became true. In the end, however, I gained a lot of knowledge of self from that situation and I am grateful for that. I have never been so sure about who I am. I continue to struggle with my relationship with my mother because she is not very supportive of my decision to be a serious actor and study my craft. I am crying as I write this because I have been dealing wth this issue for at least 10 years. It hurts so badly that she is not my biggest fan or supporter and she does not understand that. I love her so much and she has sacrificed abundantly for me to be successful while my dad has been virtually absent. So it troubles me that she does not fully show her pride about me, to me. It is a huge self-esteem killer. It’s weird because when she sees me on TV she’ll be my biggest cheerleader for that season, but after a few months she’s pressuring me again to go back to school and choose a more practical life route. I understand her concerns honestly but I am truly happy when I am doing the work I’m passionate about. I refuse to break and go down a path that does not make me happy. I refuse to be anything but myself. My ex tried to change me as well. He basically wanted me to quit acting and get a more traditional job. I tried to compromise by just working a lot harder to expedite my career results and it worked! At least for me. I made a little more money, booked so much more work, commercials, film, and tv jobs as a result from that pressure. I took it as motivation. However, it just didn’t suffice for him. He gave up on me and I cut him off completely after feeling utterly depleted from the criticism. Alas I persevered! I bought a new car, signed a new lease to an amazing apartment, and paid down a lot of debt with my own credit and ambition. Throughout it all, I realized that few will truly love me unconditionally and fully understand me. I just ask that everybody respect my life goals, the desires in my heart, and let me deal with my own decisions. I think at the end of the day, I make great decisions based on what I truly want for my life. I am not the typical pretty Black girl from Texas. I am not a pageant queen. I am not a law student. I am not pre-med. I am not a follower. I am not a hoe. I am not a baby mama. I am not the typical LA girl. I have my own identity. I am very proud of who I am. At the end of the day, I love myself! I have a heap of confidence. I know what I want. I’m doing it differently. I am not worried. I have God in my life and in my corner, always have. I have had a strong relationship with my creator for 10 years (don’t ask questions just know this). I have faith in myself. My faith is unbreakeable. So why is everyone so bothered? Do me a favor and love me or leave me the phuck alone. Let me do me. If my confidence, talent, and intelligence makes you uncomfortable, I do not apologize. Get used to it because guess what? I’ma only get better with time. I’ma keep doing me. I will not change. I am a triple Lion: Leo. LMU Lion. I have a Lion’s mane. I am a Black Queen. And no matter what I go through, I will not become bitter. I will not become jaded. I will not be ungrateful of my blessings. I will always be proud to be Etalvia.